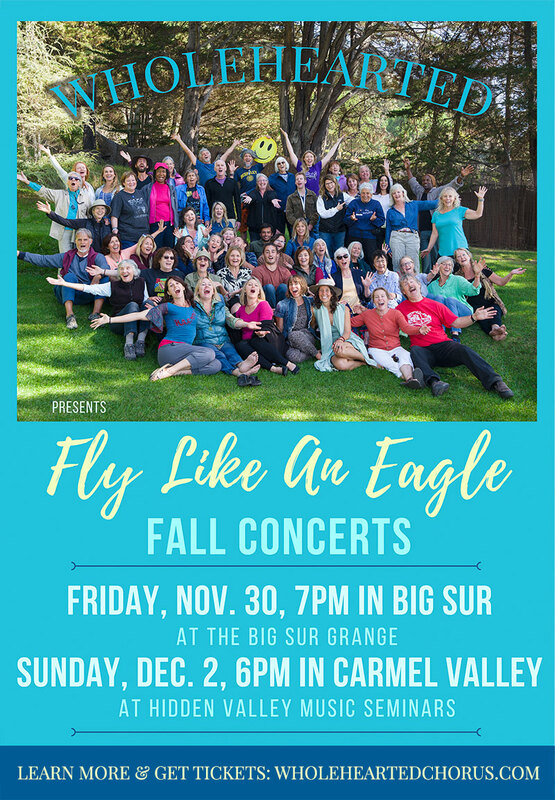 The 80+ voice Wholehearted Chorus has prepared another uplifting evening of song to share with our Big Sur community. Come out for a potent and wonderful night this Friday. The choir has grown so large, this will likely be the last one at the Grange featuring the full chorus with the kids choir… Don’t miss this very special evening! Tickets at the Grange this Friday are $10 cash at the door, kids 12 and under are free. Doors open at 6:30pm and early arrival is suggested. Bring cash for a wonderful bake sale supporting the Big Sur Health Center. The theme for this fall concert, “Fly Like An Eagle,” represents a dream – a new paradigm – where our human, American voices are used for love, inclusiveness, mutual support, unity and joy. These are not your average choir concerts… they are relaxed, conversational and a lot of fun. You will be invited to sing along, sharing songs learned by heart, direct from the heart. Hope to see you there!